RAIDMAX today announces that it will be attending Computex Taipei 2012 from June 5 to June 9, 2012 in Taipei, Taiwan. RAIDMAX is extending an invitation to all Computex attendees to visit their booth (J0510 Nangang Exhibition Hall 1F) and get hands-on experience with their latest product offerings. In addition to RAIDMAX's most recent new models – AGUSTA, RAPTOR, and ORION – they will be unveiling 7 new chassis that will be available in the 2nd half of 2012. Out of these 7 new chassis, 4 models will have a radically different body type from RAIDMAX's previous designs. Come see for yourself these chassis' innovative design. 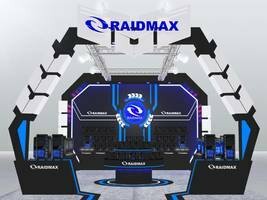 RAIDMAX's flagship model to be displayed this year is a true breakthrough in their case design. This 245mm (9.6”) wide server level chassis is equipped with two 200mm fans and other smaller fans for extreme cooling capabilities as well as excellent cable management. Additionally, RAIDMAX will demo their new 80 Plus Gold and Bronze power supplies at their booth.